Mossberg 12G 930 semi- auto JM Pro series shotgun. and clays, to good effect. Less than a year old little use, stock extended one inch black synthetic. 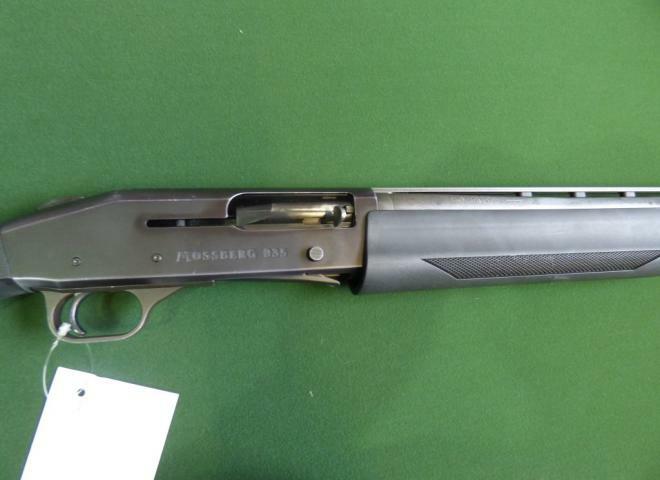 The Gun Room offers you the opportunity to purchase a second hand Mossberg 500 410 gauge pump action, hush power. With 30" barrel, full choke. As new condition. Comes with spare barrel and silencer. Excellent Mossberg 500 in a MagPul stock and foreend. Perfect practical shotgun firearm. Sect 2 can be purchased with a shotgun certificate. Ideal for pest control / noise sensitive areas. A GREAT LITTLE .410 PUMP ACTION, COMPLETE WITH SPARE HUSHPOWER BARREL. PERFECT FUN GUN, AND AN IDEAL VERMIN GUN. 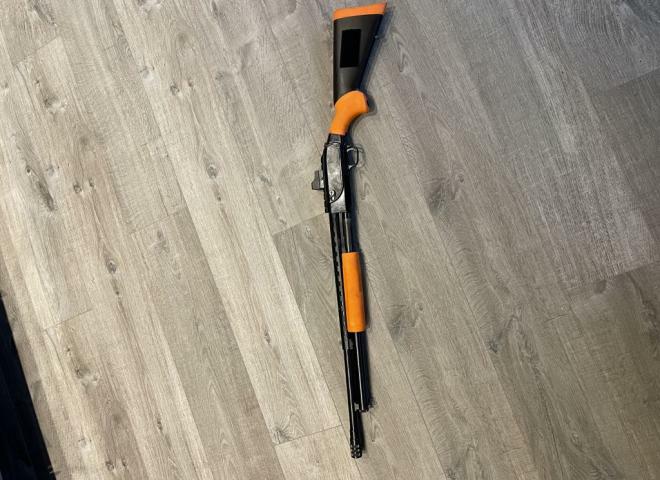 Ex Demo 8+1 Full capacity a firearms licence is required to purchase this shotgun. All purpose 3″ .410 Synthetic Stock All purpose 3″ chamber 24″ barrel, fixed choke. An ideal compact vermin gun, easily handled and lightweight. 01223 837977. SPARE BARREL NO LONGER INCLUDED AND PRICE REDUCEDSilenced Shotgun-For sale on behalf of customer,No warranty with this gun,in used condition.Synthetic. Purposeful and quieter than the average .410. These Mossberg moderated versions are great for vermin and pest control where it's necessary to be discrete. 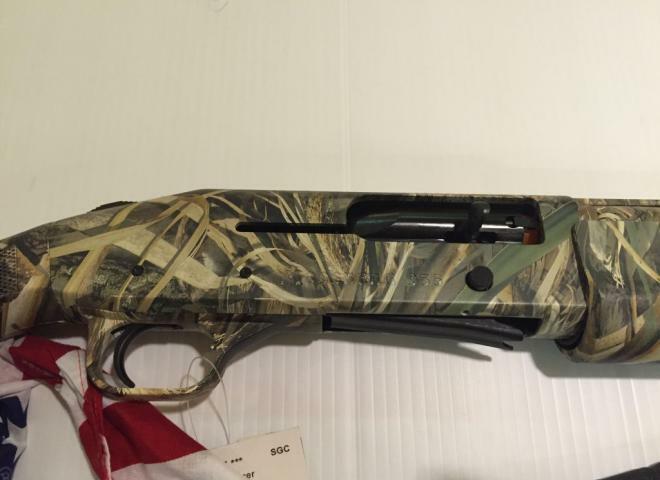 Very little used Mossberg 590 12g Pump Action finished in Marinecoat. Very good condition, includes cartridge pouch. Hushpower fully moderated shotguns - as quiet as an air rifle With 50 years in the field, todays Mossberg 500 continues the tradition of rugged dependability that had made it the pump-action of choice for millions of users around the world. A moderated version of the Mossberg M500. The STEALTH moderator is machined from one piece of high grade aluminium giving superior noise attenuation. IDEAL 3 SHOT SILENCED PUMP ACTION 410. New Mossberg 410 gauge pump action shotgun with silenced barrel. A great looking Tactical 590 in synthetic stock. Condition is excellent.
. this shotgun is full capacity therefore requires a current UK Firearms certificate to purchase. This gun is designed to fire minimum 35gr load with cartridge length of 3" or 3 1/2" which makes it ideal for wild fowling. Just been serviced and in good working order. Scope rail fitted with red dot sight. All purpose 3″ .410 P/A 24″ barrel, black synthetic stock/ fore end, fixed full choke, 2 x 12mm spacers fitted to the stock can be removed to make this a youth gun . 5 shot Slug gun fitted with open rifle sights.